Most people do not realize that chiropractic has been around for over 100 years in the United States. Over 50,000 Chiropractors, licensed in every state and recognized worldwide, have been treating patients just like you by focusing on the source of your pain or disease instead of covering up the symptoms. If you are new to chiropractic care, this site can provide some answers to your most basic questions - just go to our Frequently Asked Questions and learn about the history of chiropractic and the formal education and training chiropractic doctors achieve. In our Treatment Center you can learn how simple, safe and comfortable chiropractic treatment is and how it can improve your quality of life. Is pain, injury or stress preventing you from being yourself? Florida Chiropractor's experienced chiropractic care can bring you back to a healthy life. 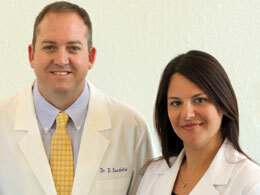 Florida Chiropractor offers a contemporary approach to chiropractic care. We can help you regain the quality of life you may have been missing with our non-invasive, drug free treatment, in a professional and familiar environment. Our doctors and therapists are well-qualified licensed professionals dedicated to treating adults and children in a personalized manner. If you are looking for a caring chiropractor in the St. Petersburg/Tampa Bay area, please consider visiting our clinic - located in St Petersburg. When you choose our office you have selected the most effective and familiar chiropractic techniques provided with professionalism and personalized attention. Our Florida Chiropractor location has served the chiropractic needs of St. Petersburg for over 30 years. Through years of clinical experience, chiropractors have found that most spinal problems can be traced back to a previous trauma, such as an auto accident or fall. If you have recently been involved in an accident it is important that you have your injuries diagnosed by one of our clinicians. Check out our auto injury care section in the Treatment Center for more information. We can answer your questions and detail the full range of treatment options available at Florida Chiropractor. Many common conditions not typically associated with the spine have responded favorably to chiropractic care. It�s easy to see the relationship between back and neck pain with misalignments of the spine. Spinal nerves also travel to your internal organs and tissues controlling most functions of the body. With this perspective you can imagine how a digestive problem, allergies or even a child�s earache might respond to chiropractic treatment. Visit wellness care in our Treatment Center to see more information about the positive "side-effects" of chiropractic care and read about conditions that our patients have overcome with a healthy nervous system. If you are interested in optimal health visit the Well-Being Section and see how Florida Chiropractor can help you get there, naturally.